Port Dickson is a town on Malaysia’s west coast, south of Kuala Lumpur. 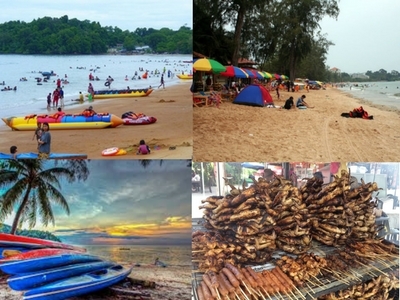 Beaches dot the coastline running south toward Tanjung Tuan, a wildlife reserve and birdwatching spot with a 16th-century lighthouse. East of the reserve is Fort Kempas, with a 14th- or 15th-century sacred Islamic tomb and several megaliths. Lukut Museum, northeast of Port Dickson, has exhibits about the area’s history from the early 1800s. Tanjung Tuan - Tanjung Tuan or Cape Rachado is an exclave of the state of Malacca, Malaysia, adjacent to the town of Port Dickson, Negeri Sembilan. The cape is well known for the Cape Rachado Lighthouse facing the Strait of Malacca. Kota Lukut - The Lukut Fort and Museum is a historical site in Port Dickson, Negeri Sembilan, Malaysia. The fort was built by Raja Jumaat in 1847 and later controlled by his son Raja Bot. Alive 3D Art Gallery - Quirky art gallery where guests pose & take photos within 3D & interactive paintings & murals. Sultan Abdul Samad Mosque - The Sultan Abdul Samad Mosque or KLIA Mosque is a mosque near Kuala Lumpur International Airport at Sepang District, Selangor, Malaysia.